The Minaal Carry-On is a favourite of digital nomads. The bag features a lie-flat packing system, easy access for laptops, and it adheres to all airline carry-on sizes. This bag is a 3-in-1 travel backpack, messenger bag, and duffle. Designed with concealable backpack straps, compartment dividers, side and top handles. 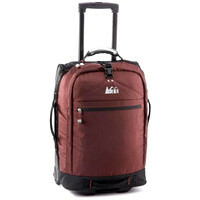 It comes with an expandable capacity of 35 – 45L and fits airline size rules. The REI carry-on-size rolling beast is as burly as ever and fits in most airline overhead bins. Smooth-rolling wheels and inside features 2 zip mesh pockets and compression straps. The Farpoint series brings streamlined features and light weight, with two torso sizes for a simplified but custom fit. Best Carry On Luggage Deals – Plus free shipping over $75 & free returns at Irv’s Luggage. MyFly Bag – Customize your very own carry-on suitcase with your photos and text, by LuggagePros.